My Logan Aberdeenshire Logan family tree springs from my gg grandmother Mary Logan, who married Alexander Fraser in 1864. I can trace back to her parents (John Logan and Isabella Booth) and her grandparents (James Logan and Catherine Smith) but can get no further back than her grandparents’ marriage in 1789. That James and Catherine are the parents of my ggg grandfather John Logan is confirmed by his sister Jane’s death certificate. Jane did not marry and when she died in 1878, the informant was her grand-niece, granddaughter of my ggg grandfather John. Jane Logan’s death certificate names her parents as James Logan crofter and Catherine Smith. 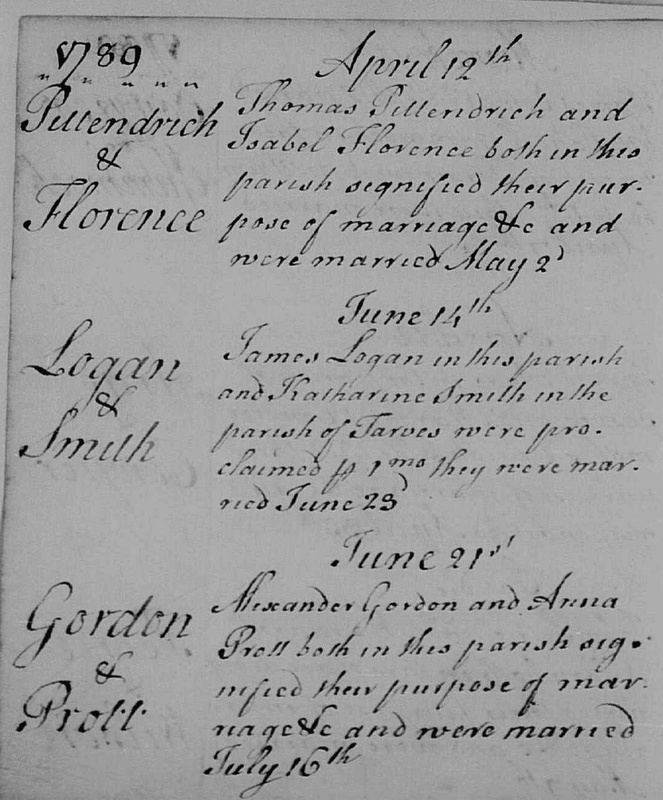 James Logan and Catherine Smith were married on 14 June 1789 at Methlick, with James of Methlick parish and Catherine of Tarves parish. They may not have been born in those parishes, however, as they were probably working as farm servants at the time. They had four children baptised in the parish of Old Deer in 1791, 1793, 1796 and 1799, and these OPR baptism records give a location of Mains of Annochie for James Logan. 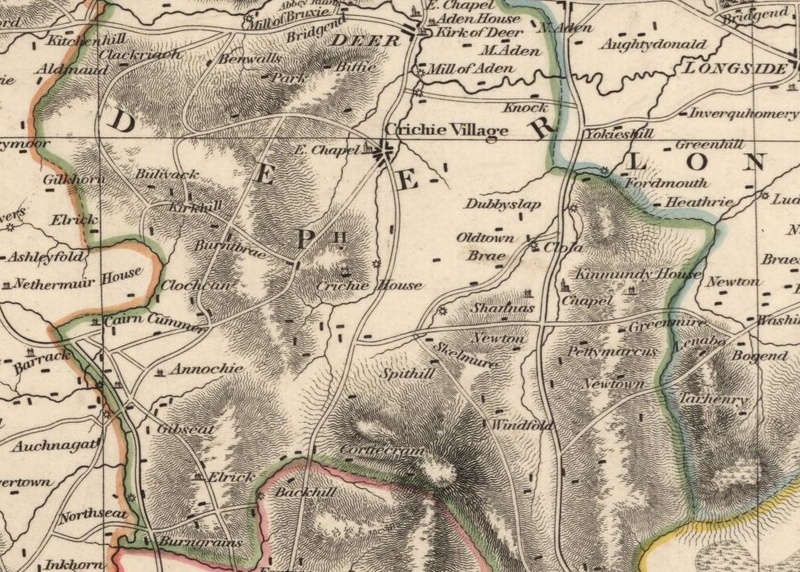 Annochie can be found on the map of 1832, at the south of the Old Deer parish boundary. There is not enough evidence to be sure who the parents of James and Catherine were, and it’s quite possible that their baptisms were not recorded. 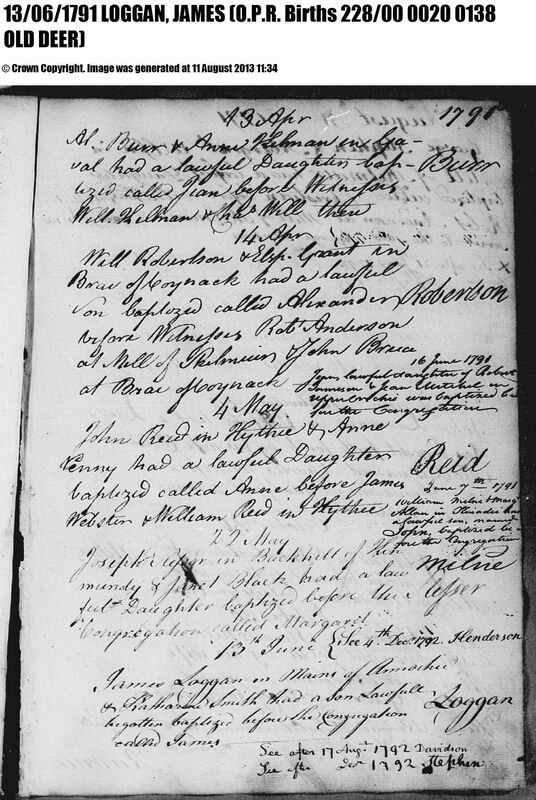 There is a James Loggan born on 8 April 1753 at Old Deer to George Loggan of Miln of Creichie and Elizabeth Morice. Creichie is not far from Annochie, where James and Catherine were when their children were baptised, and it’s also close to where James Logan’s son John and his daughter Jean/Jane lived next door to each other in 1841. So the 1753 baptism could well be the right James Loggan, but if it was he’d have been 36 when he married Catherine. This is quite old, unless it was second marriage. 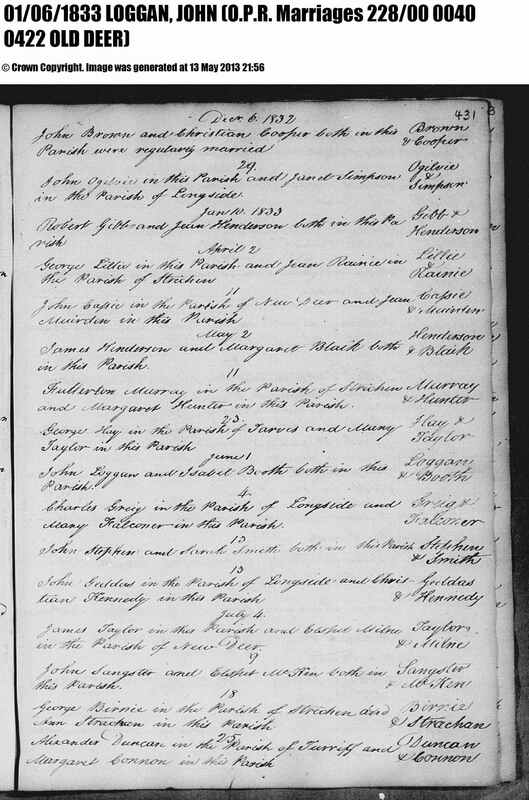 There is a Catherine Smith baptised in New Deer in 1772, daughter of John Smith and Margaret Bernie but this makes her almost 20 years younger than her husband James Logan and means she would have been 16 when she married, so I’m not convinced this is the right one. Using the Scottish naming pattern, which is by means infallible, and assuming the children baptised in Old Deer were the first children born to either James or Catherine, I’d expect the parents of James to have been James and Barbara, and the parents of Catherine to have been John and Jean. This doesn’t fit with the James Loggan and Catherine Smith found in the baptism records. The conclusion is that is quite probable that neither of the extant baptisms is the the right one for James or Catherine, so the origins of my Logan gggg grandparents are unknown. The marriage of James Logan and Catherine Smith took place in 1789, and their known children were born in 1791, 1793, 1796 and 1799. It is likely they had more than 4 children if they both lived beyond 1799, but the date of death for both James Logan and his wife Catherine is unknown. They both died before the 1841 census and there are no surviving burial records for Old Deer after 1806. James Logan was baptised at Old Deer on 13 June 1791 but nothing else can be found. He may have died in childhood. 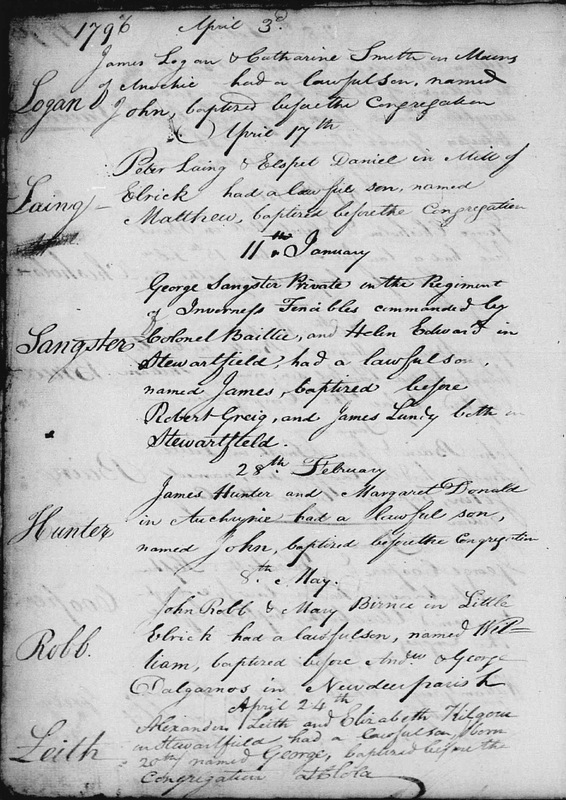 Baptism of James Logan in 1791, which also shows that the keeping of baptism records was a bit on the messy side! Jean Logan, orJane as she was named in the census and on her death certificate, was baptised on 8 September 1793 at Old Deer. She did not marry, and in 1841 is living at Auchtilair next door to her brother John Logan and his family and earning her living as a “sewster” – probably some kind of dressmaker. In 1851 she is a pauper formerly house servant living at East Street, Stuartfield, which is a village just north of Auchtilair, and she remained there for the rest of her life. In 1861 she has living with her niece Jane Loggan age 33 and Jane Creighton 8 months, daughter of her niece. Niece Jane is the daughter of her brother John Loggan and was a school mistress, and her daughter Jane Creighton was illegitimate. Neice Jane and her daughter are still living with aunt Jane in 1871. Jean or Jane Logan died in 1878, a pauper formerly dressmaker, and on her death certificate her parents are given as James Logan crofter deceased and Catherine Logan ms Smith deceased. The informant was her grand-niece Jane Creighton. My direct ancestor – see below. Barbara Logan was baptised at Old Deer on 1 September 1799 but nothing else can be found. She may have died in childhood. John Loggan was baptised on 3 April 1796 at Old Deer, his parents residing at Mains of Annochie. John Loggan and Isabella Booth were married on 1 June 1833 at Old Deer. From the ages given in the 1841 census, John was a good 10 years older than Isabella. This means that the two eldest children shown in 1841, Jane born about 1826 and William born about 1830, were likely to be from a first marriage of John Loggan – unfortunately there are no baptism records for Jane and William. However, William died in 1858 and his death certificate gives his parents as John Logan farmer and Ann Logan ms Simpson. John Logan and Ann Simpson were married on 14 November 1829 at Old Deer so Ann must have died between 1830 and 1832. This means, though, that Jane Loggan, age 14 in 1841 and who later lived with her aunt Jane in Stuartfield, may have been born before John Logan and Ann Simpson were married. I need to look at the Old Deer Kirk Session Minutes next time I’m in Edinburgh. John can be found in the 1841 census at Auchticlair, Old Deer, a farmer age 35 (which will mean age 35-39) with wife Isabella age 25, and six children aged from 14 years to 1. 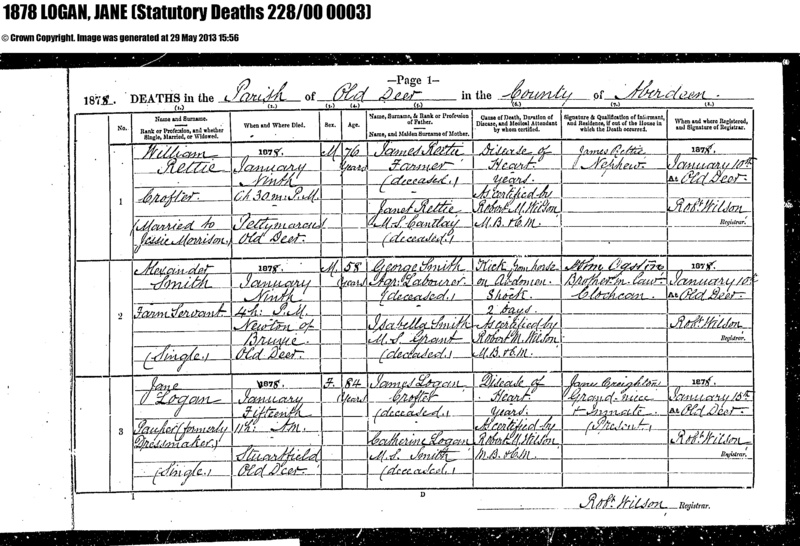 The 1 year old is my ggg grandmother Mary Logan, whose 1867 death certificate gives her parents as John Loggan farmer and Isabella Logan ms Booth. 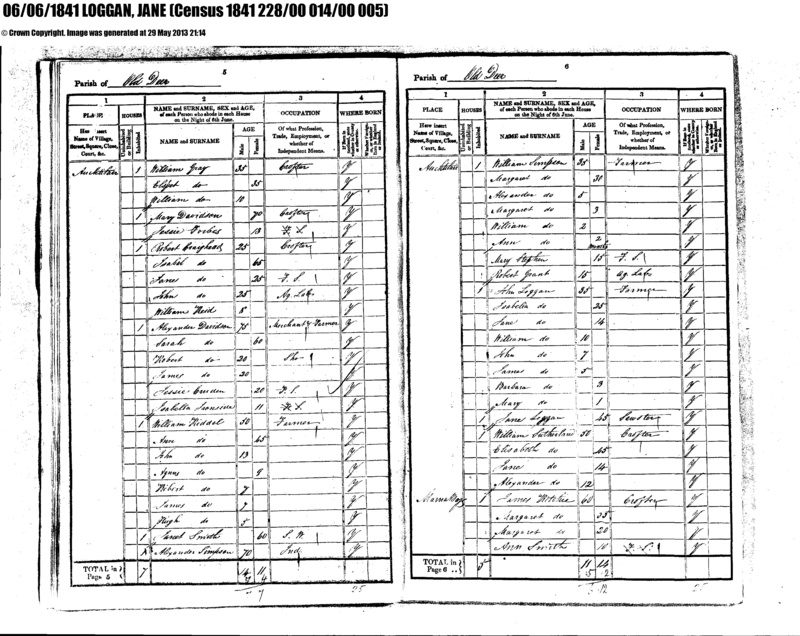 The 1841 census showing John Loggan with his wife and six children, and his sister Jane living next door. John Loggan and Isabella Booth had five children born between 1834 and 1842. John Loggan must have died sometime between 1842 and the 1851 census, but unfortunately this is before the introduction of death certificates in Scotland. Auchtilair is roughly in the centre of the map below, next to the thick black line and written as Auchtylair. 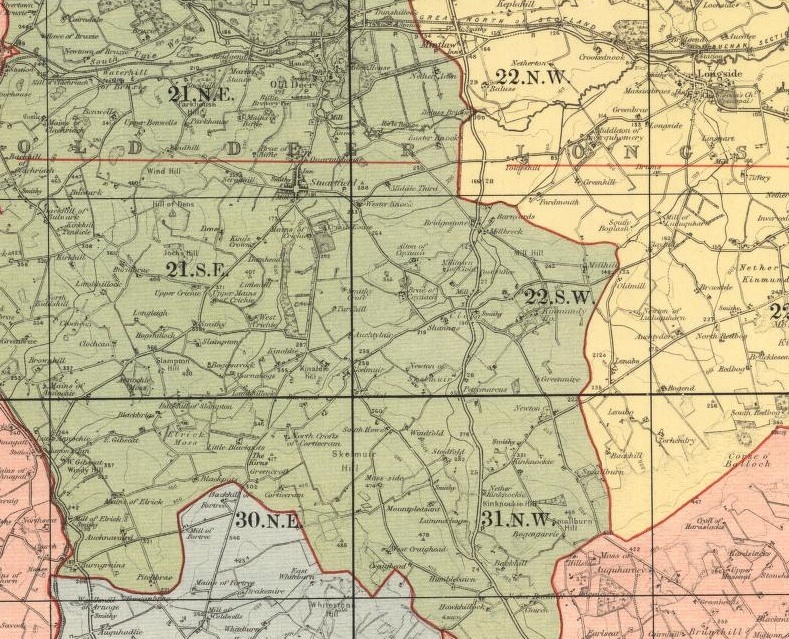 This map of 1898 shows where Auchtilair was sutuated south of Stuartfield. In the 1851 census Isabella Loggan is at Auchtilair, Old Deer with her two youngest children, Mary and Barbara. She is described as a knitter born in Alford. Then in 1853 she remarried at Old Deer to Charles Rennie, but I can’t find them in the 1861 census. In 1871, however, Isabella Rennie age 58 born Alford, is at Woodland, Dyce with James and Barbara George and their children: this is Isabella’s youngest daughter Barbara. By 1881 Isabella must have been widowed again as she has reverted to Isabella Booth and is living on her own in Old Machar, Aberdeen, an unemployed domestic servant, and is still in Old Machar in 1891, at 292 Holburn Street, age 78 and a former cook. She died there in 1899, of stomach ulcers, and her parents are named as William Booth blacksmith and Margaret Booth ms Allan – the informant was nurse Isabella Ewan. No baptism can be found for Jane, but from the age and birthplace stated in census records she was born in about 1827 at Old Deer. In 1841 she is at Auchtilair with her father, stepmother and younger siblings. I can’t find her in the 1851 census but she was most probably working somewhere as a domestic or farm servant. In 1861 she is living at East Street, Old Deer with her aunt Jane Loggan, her father John’s sister, and her 8 month old illegitimate daughter Jane Creighton, and is working as a general servant. She is still there in 1871, still working as a general servant. Her aunt Jane died in 1878, and in 1881 Jane and her daughter Jane are at South Lodge of Aden, Old Deer, and her daughter is a school teacher. By 1891 Jane has acquired two grandchildren, William Watt and James Creighton, both illegitimate sons of her daughter, and is living with them at Quartale House, Old Deer – her daughter is working as a servant in Old Machar. Jane is at the same address in 1901 at age 74 with her youngest grandson James, now known as James Bremner. Frustratingly, I cannot find a death certificate for her on ScotlandsPeople. 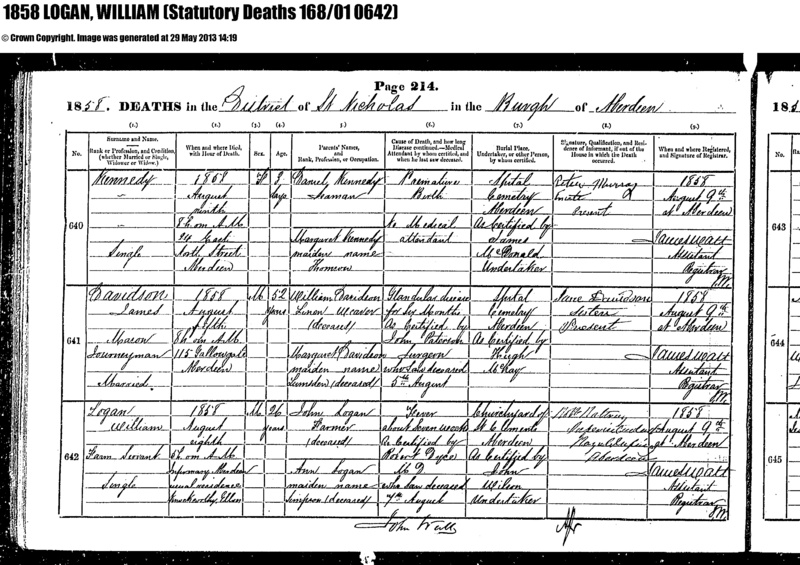 No baptism can be found for William but he was born in about 1830 at Old Deer. He is with his father, stepmother and siblings in 1841 at Auchtilair. By 1851 he’s working as a farm labourer and is in the household of farmer John Cruickshank at Turnalove, Cruden. William died, unmarried, in 1858 at Aberdeen Infirmary of fever, and his death certificate states his parents were John Logan farmer deceased and Ann Logan ms Simpson deceased. John Logan was born 14 May 1834 and baptised at Old Deer – his baptism record gives his parents as John Logan of Auchtilair and Isobel Booth. He is at Auchticlair age 7 in 1841 with his parents and siblings, and in 1851 is working as a farm servant at Tarves. He married Jean Marr at Slains on 17 November 1855, and in 1861 they’re at Auchenleuchries, Cruden, John an agricultural labourer, and have three children. By 1871 John has taken a lease of 6 acres at Muirtack, Cruden, which is next door to Auchenleuchries, and they have had two more children. They remain there in 1881 and 1891. In 1881 they have son William with them, who is a pupil teacher, and they also have a boarder William Coutts age 11: William Coutts was the son of George Coutts and Janet Colven, and his mother had died, but I’ve no idea why he was with the Logans as his siblings are with his father and stepmother in 1881. In 1891 James Logan and Jane have a grandson with them, George M Logan age 3 and born in Dundee is the son of their son James Marr Logan, and they also have domestic servant Mary Robb age 12 with them. John Logan’s wife Jane Marr died, and in 1901 John is at Hillhead of Auchenleuchries, age 66 and a crofter, with grandson William Logan age 12, who was another son of John’s son James, domestic servant Barbara Fraser plus boarders Bella Fraser age 10 and Mary Oliphant age 1 who may well be children of Barbara Fraser. John Logan died at age 70 on 8 December 1904 at 54 Rosemount Viaduct, Aberdeen, the home of his daughter Jane Davidson Marshall nee Logan, and his death certificate confirms that his parents were John Logan farmer and Isabella Rennie formerly Logan nee Booth. James Marr Logan was born 1855 at Slains and was married twice: to Georgina Farquahar at Dundee and then widow Jane Kelly or Smith at Ellon. He worked firstly as a farm servant and then became a boot finisher and shoemaker and had five children. George Marr Logan was born 1857 at Ellon and died at Cruden in 1857. John Logan was born 1858 at Cruden, became a slater, and died unmarried in 1892 at his parents’ home at Muirtack, Cruden of tuberculosis. Jane Davidson Logan was born 1860 at Cruden, became a dressmaker in Ellon, and married carpenter James Marshall at Ellon in 1895, after which the family lived in Aberdeen. Isabella Logan was born 1862 at Cruden and died there in 1877. William Logan was born 1864 at Cruden and was a pupil teacher at Cruden in 1881. By 1891 he was in Dundee as a mercantile clerk with wife Maggie Souter Butchart, and then was a grocer in Newburgh, Fife in 1901 with four children and his father-in-law and sister-in-law. William and Margaret Logan migrated to the USA in 1921 to join their sons in Michigan, where William died in 1929. James Logan was born 15 February 1836 at Auchtilair and baptised at Old Deer. He is with his parents and siblings in 1841, and is working as a farm servant in 1851, age 16, at Windyhill, Logie Buchan. He married Jane Norrie at Belhelvie in 1855, and in 1861 they are at Davieshill, Foveran, where James is a ploughman, with three children and visitor Barbara Logan, James’ younger sister. They seem to have lived a typical farm servant’s life, moving fairly regularly, for in 1871 they are at Blackhill of Courtstone, Tarves, with five children and in 1881 at Silvermoss, Tarves with two children and a grandson. James’s wife Jane died, and in 1891 James is at Blackhill of Courstone, Tarves with a daughter and a grandson. James Logan died at Tarves in 1900 age 64. William Norrie Logan was born in 1855 at Belhelvie and became an agricultural labourer horseman working and moving from place to place as the baptisms of his children show. He married Jane Lawrie, had six children, and became a crofter in Methlick, where he died of cancer of the liver in 1914. James Logan was born in 1857 at Belhelvie and worked as a farm servant ploughman. He did not marry, and in 1891 and 1901 had moved to Kincardineshire. He moved back to Aberdeenshire, though, as when he died in 1931, still single and a retired farm servant, he was living either with or near to his nephew Douglas, son of his brother Wiliam, at Westburn, New Machar. He died in hospital of cancer and peritonitis. Elizabeth Logan was born in 1859 and worked as a servant on farms. In 1887 she married shepherd John Kynoch at Savoch: they lived in Methlick and had four children. Elizabeth died in 1895 age 34 at Methlick, of cancer of the uterus, and in 1901 her children are living with their grandmother Isabella Kynoch, although her eldest son George was working as a farm servant. Most of her children migrated to Canada. Mary Logan was born in 1861 at Belhelvie, worked as a cook on farms, and married shephard William Yule at Tarves in 1882, who came from Nigg in Kincardineshire (which was where her brother James was working in 1891). The first three children of Mary and William Yule were born in Tarves, then they moved to Newhills, near Aberdeen, where they had more children. Mary died of heart failure in Newhills in 1939. Margaret Ann Logan was born in 1864 at Auchterless, and was working as a servant on a farm in Fyvie in 1881. After that she’s a mystery, as I can’t find a death, marriage, migration or anything in the census. Isabella Logan was born in 1866 at Fyvie, and was a domestic servant at Old Machar in 1881. She had an illegitimate son William Henry Logan, born at Methlick, and then married John Sharp in 1887 at Savoch. They had at least six children and lived firstly in Methlick, the moved to Belhelvie. Isabella Sharp ms Logan, widow of farm manager John Sharp, died in 1948 at Gilchristland, Closeburn, near Dumfries, where she seems to have been living with her daughter and son in law. George Logan was born in 1869 at Fintry, and with his parents in 1871 and 1881 but thereafter disappears as I’ve not been able to find anything for him in the records. Jane Logan was born in about 1871 in Tarves, and is with her parents in 1881 and with her father in 1891. After that I haven’t found her, except for a death certificate: she was married to crofter John Fraser and died at Pitmedden in 1948. Mary Logan is my gg grandmother. She was born on 27 March 1838 at Auchtilair and baptised at Old Deer, and is with her parents and siblings at Auchtilair in 1841. Her father died before 1851, as in 1851 she is at Acutilair, age 12 and at school. with her mother and younger sister. Mary then went out to work as a farm domestic servant, and in 1861 is at Eggie Farm House at Belhelvie. In 1864 she married my gg grandfather Alexander Fraser at Ellon. Confusingly, Mary’s marriage certificate gives her parents as John Loggan farmer and Mary Loggan ms Forbes. I have no idea why the wrong information is on her marriage certificate, but wrong it is and her death certificate is right. Who the heck was Mary Forbes? Did whoever wrote up the marriage certificate make a mistake? At the time of her marriage Mary Logan was a domestic servant at Drumwhyndle, Ellon – Alexander Fraser was working as a farm servant so they may have met when working on the same or neighbouring farms. Mary and Alexander had two children, William born at Oldtown of Aquaharney, Cruden in 1865 and Mary Ann born in 1867 at Collieston, Slains. Six months after the birth of her daughter, Mary Ann Fraser ms Logan died at Mosside, Cruden, Alexander’s parent’s croft. She died of phithis (tuberculosis) and the death certificate gives her parents as John Logan farmer deceased and Isabella Logan ms Booth. Alexander Fraser remarried, to Margaret Booth. For more on Alexander Fraser and Mary Logan, see under Fraser tab. Barbara Logan was born on 3 April 1840 at Auchtilair was was baptised at Old Deer. She is with her parents and siblings at Auchtilair in 1841 and with her widowed mother and sister Mary in 1851. In 1861, age 20, she is a visitor to her brother James and his wife and children at Fovernan, her occupation domestic servant. Barbara married James George at Fyvie in 1864 and in 1871 they are at Woodland, Dyce, James George an agricultural labourer and with five children. Also with them is relative Alex Littlejohn age 9 (though I don’t know how he was related) and Barbara’s mother Isabella Rennie, who had been widowed a second time. The George family migrated to Ontaria, Canada in 1872, and an obituary posted online for their son Alexander says that they first went to Doon, then to Ayr, and then James George purchased 100 acres of bush at Brant Township, near Walkerton, which he and his sons cleared and turned into a farm. They family is in the 1881 at Brant, Bruce South, Ontaria, James a farmer and with eight children. They are still at Brant in 1891 with their younger children. Barbara George died in December 1894 at Bruce age 53. John Logan George was born July 1861 or 1862 (before his parents were married) at Cruden, and migrated to Canada with his parents in 1872. Her married Christina Little and was a farmer in Brant, Ontario, had children, and died in Brant in 1935. Jean Scott George was born July 1864 at Fyvie, and migrated to Canada with her parents in 1872. In 1891 she was housekeeper for her brother Alexander, and then married widower John Hampson in 1892, who died in 1897. She is in the census in 1901 and 1911 in Brant and then Walkerton with her three children and stepdaughter. Alexander George was born in about 1866 at Kineller, and migrated to Canada with his parents in 1872. In 1891 he is a farmer at Brant, Ontario with his sister Jean as housekeeper, but by 1907 had become a wood and coal dealer, as in that year he married Susan Chapman in Ottowa. She died, and in 1922 he married Elsie Freeman at Walkerton, Ontario. His obituary in 1953 says he was a wood and coal dealer in Walkerton for over 50 years, had been a member of the Walkerton Town Council, and was survived by five daughters. Barbara George was born in 1868 at Dyce, and migrated to Canada with her parent sin 1872. In 1892 she married Richard Addison Brocklebank at Bruce, Ontario and they are at Calgary, Alberta in 1906 and 1916 with two daughters. Richard Brocklebank joined the army in WW1 and was killed at Ypres in 1916. In 1917 Barbara and her daughters arrived at Seattle, USA but returned to Canada, and then in 1920 sailed from from Vancouver to California. In the 1920 USA census they are Santa Monica. They seem to have returned to Canada, though, as her daughters can be found there after 1920 but I haven’t been able to find anything further for Barbara. James George was born in Dyce in December 1871 and migrated to Canada with his parents in 1872. He was with his parents and then widowed father in 1881, 1891 and 1901 at Brant and then Walkerton. He moved to Toronto and in 1906 married widow Sarah Hare at Port Credit. They’re in the 1911 census at Toronto, and James is a teamster. According to a tree on Ancestry he died at Port Credit in 1937. Francis Simpson George was born in 1872 at Berlin, Waterloo, Ontario but died before 1881. Isabella George was born in Waterloo, Ontario in 1873. She married Herbert Dixon and in 1901 they are in Toronto with a young child. She died in 1966 at Toronto. William George was born in Ayr, Waterloo, Ontario in September 1876 and married Louise Schrooer, from Germany, in about 1901. They had several children. William died in 1919 at the age of 43 as the result of an accident. He was employed as a liveryman at the time. Annie George was born in Ontario in about 1878, and is with her parents in 1881 and 1891 at Brant, and with her widower father in 1901 at Walkerton. I haven’t been able to trace her beyond that with any certainty. David Morrison George was born in January 1882 in Ontario, and is with his parents at Brant in 1891. In 1901 he is a lodger in Brant. He married Elizabeth May Rennie at Walkerton in 1926, but they seem to have been together some years as the they had a son born in 1921. In the 1930 USA census they are living in Erie, New York with their son and David is working as a construction engineer. According to a tree on Ancestry he died at Buffalo, New York in 1936 at age 56. Elizabeth Logan was born on 12 September 1841 and baptised at Old Deer. She is not with her widowed mother in 1851 and nothing else can be found in the records, so it looks as if she died when young. I am the son of William Creighton Watt born to Jane Creighton 1883 at Kirkhill Invernesshire where she was a school teacher, she went on to marry an Adam Main and died in 1934. I hope in thinking this is the Jane in your tree.